The Parson Russell Terrier Association of America was founded in 1985 as the Jack Russell Terrier Breeders Association (JRTBA), and was later changed to Jack Russell Terrier Association of America. 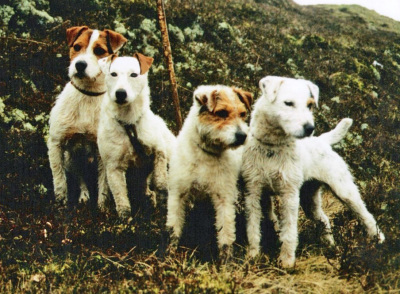 The breeders who gathered to form the club had one terrier in mind, a balanced dog of distinctive type and weatherproof jacket, measuring between 12" and 14" in height with a chest circumference allowing the terrier to go underground with ease. The terrier's sole purpose was to follow the hunt in pursuit of the European red fox, and to bolt him from the earth when he went to ground. The Parson Russell Terrier has a long and well-documented history in the evolution of hunting terriers in England. The Parson is the terrier that was bred by Britain's Rev. John Russell in 1880, and that terrier remains the blueprint for the breed today. In the decade from 1987 to 1997, a small group of dedicated JRTBA members worked ceaselessly to achieve AKC recognition for the breed. The AKC unanimously accepted the Jack Russell Terrier into its registry on November 1, 1997. In January 1998, the breed became eligible for competition in all AKC events, including conformation participation in the Miscellaneous Class at all-breed shows. The breed entered the AKC Terrier Group on April 1, 2000, and in October of 2000, the club held its National Specialty at the prestigious Montgomery County Kennel Club show. to separate the AKC Parson from the "Jack,"
a short-legged terrier longer in body than tall, and to be consistent with the breed name in England (the Parson's country of origin), Europe and Australia. Consequently, the club name was changed to the Parson Russell Terrier Association of America (PRTAA). The Breed Standard was last revised effective September 29, 2004. The PRTAA is the Parent Club for the Parson Russell Terrier in America. Members of the club maintain the breed standard and in doing so protect the future of their terrier. Membership in the Association is open to those who support its goals and its ideal for the breed, and who honor the important height disqualifications incorporated in the Breed Standard to preserve the working abilities of the Parson. The PRTAA operates in full acknowledgment of the original purpose of the traditional Parson Russell Terrier as it was in Rev. Russell's day: to hunt red fox above and below ground; and to promote the distinctive type terrier bred by Rev. Russell.